Now, onto Palets de Dames, our first recipe! Palet means “puck” in French. While they may be shaped like little disks, there’s nothing hockeypuck-ish about these little cake-cookies. They’re soft and flavored with vanilla and are a perfect tea or coffee break treat. The cookie dough is actually like making a simple cake batter and the icing is just whisked together. Not too hard, although somehow I did manage to make a little screw up. I think I was actually supposed to dip their bottoms in glaze and serve them upside-down. I did the opposite. Oh well…ce n’est pas grave, as they say. They’re still dainty and cute, and I thought they deserved a little sparkly bling on top of the sweet glaze to celebrate our first BCM post. For the recipe, see Baking Chez Moi by Dorie Greenspan (it’s also here). Don’t forget to check out the rest of the TWD Blogroll and please join us, if you haven’t already! They look delectable – I have never heard of these before. I wondered about the upside down thing, too. The description at the top of the recipe makes it sound that way, but the picture looks like they’re glazed on top, like yours (and mine). Hi Steph, These look absolutely lovely! Glad we will be baking together through BCM! Happy baking! Love that the band is back together! Your cookies are adorable. These are so pretty! Love those little silver sprinkles! It’s going to be a bit of a logisitcs challenge to cook/ bake from AMFT, BWJ & BCM all at the same time, but I am up for it! lovely! the silver balls on the white cookie looks elegant (and tasty). Hello again ! I recall baking with you on either AMFT or while we (Nana and I) briefly did that AND Tuesdays. So fun to be starting a new book adventure together and we are all off to a great start with these cookies. Yeah, puck is not the right term for these – they are adorable. Yours are so pretty! Love your cookies with the silver drags! I did mine upside down too, or right side up, however you want to look at it! Perfectly lovely with those silver sprinkles. We’re off to a great start with these delicious cookies with the BCM edition of TWD of which I’m happy to be a part. Also, I just wanted to add my thanks for doing such a great job in helping to administer the site – it’s much appreciated. I just realized after reading your post that it’d have been much easier to glaze the cookies if I’d done the flat bottoms. HA! And you’re right: ce n’est pas grave! 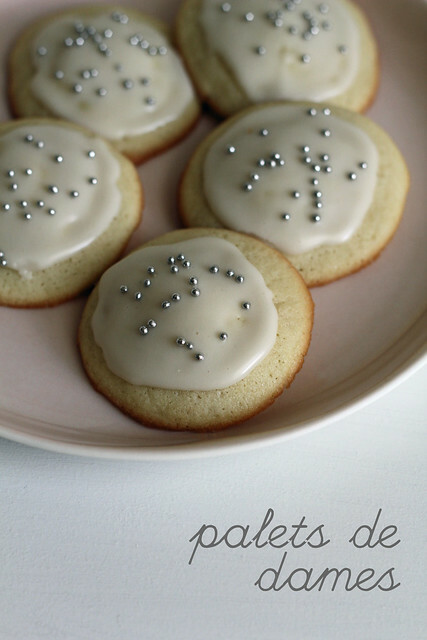 Love the silver sprinkles on the cookies–just beautiful! It was so much fun to open up a new book and to start baking with TWD again! Your cookies look so special! I didn’t do any decorating–which I must attribute to having gotten in from a cross country flight late the night before I made them! But next time I make these, they’ll have lavender sanding sugar! Oooh, pretty cookies! Your take with the silver sprinkles looks so elegant – almost wedding favor worthy. Nice meeting you, Stephanie! I love the sparkly bling on the top! 🙂 Glad to be baking with you in the new book! They look so pretty with the silver dragées! I’m glad to be hopping over here from French Fridays with Dorie to join in on baking through the book. I love how you decorated your cookies. Very fancy! I didn’t realize the bottoms were supposed to be dipped either. That definitely would have made mine prettier! I love the silver balls – lovely. Your cookies look so elegant with the silver sprinkles! These cookies are delightful. Hoping to join BWJ if I can find the time! Looking forward to a delicious journey with all the lovely bakers at TWD. So pretty with the silver dragées! This looks to be a fun adventure! Your cookies look great! Looking forward to baking with the group!! Oooo – I’m in! Brilliant idea! Will bake these this morning. Spreading the newly found Dorie love here in Ireland – a recent ‘believer’!! Excited that BCM is my first Dorie read – cant wait to go back to read her other books.